Intertape 1100 Utility Grade Hotmelt CST Carton Sealing Tape has excellent processing performance whether manually or automatically applied. Superior adhesion properties, holding force, tensile strength, and easy unwind ensure consistent, reliable seals to a variety of corrugated and linerboard boxes. 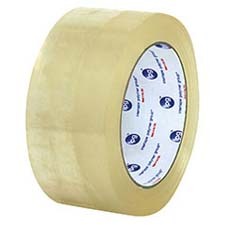 3 mil Premium Carton Sealing tape. Synthetic Rubber/Resin adhesive and BOPP Film backing. For optimal closure of recycled corrugate boxes down to 35°F.